Come and see me at the Ashland branch of the Pamunkey Regional Library in Ashland, Virginia on Wednesday, March 18 from 7-8:30 pm! The library will be giving away new seeds from Southern Exposure Seed Exchange and I will be giving the presentation Growing to Seed to Share. My talk will include organic gardening and seed saving tips, as well as well as inform you of the seed library movement taking place around the country. Afterward, I’ll be signing my books–Seed Libraries and Other Means of Keeping Seeds in the Hands of the People and Grow a Sustainable Diet: Planning and Growing to Feed Ourselves and the Earth. My DVDs will also be for sale. I attended my first sustainable agriculture conference in 1990. At the time I was a home gardener and hadn’t ventured into the area of market gardening yet. That would happen two years later, and when it did, I was much better prepared than I would have been if I hadn’t had the benefit of hearing real-life stories of how others were doing it. Besides hearing from the farmers, I learned about the research being done at our land grant colleges. 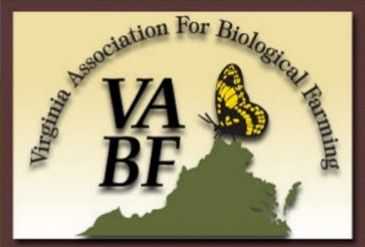 That first conference I attended was sponsored by the Virginia Association for Biological Farming (VABF) and was their third annual, if I remember correctly. There was a disconnect sometime in the 1990’s and no conference was held for a few years. I see that this year’s Virginia Biological Farming Conference is billed as the 15th annual, the count beginning over when things started up again. Now the conference is a joint project of VABF and Virginia State University. In 2014 it will be held January 31-February 1 near Richmond, VA, with extra workshops offered on January 30. Attending a conference such as this is a terrific opportunity to meet the movers and shakers in the sustainable agriculture movement. At my first conference Fred Kirschenmann was the keynote and told of how he returned to the conventional family farm to help his father and converted it to organic production. Fred stars in the film My Father’s Garden that has been made since then, showcasing the struggles that farmers face and why they make the decisions they do. I highly recommend it. I had the pleasure of hearing him speak again at a conference in 2007. A word of advice—if you ever have to take a plane to speak at a conference, make sure you are wearing something you wouldn’t mind getting up in front of hundreds of people in, in case the airline loses your luggage. That’s what happened to Fred in 1990. The first edition of Eliot Coleman’s The New Organic Grower was published in 1989 and he was a presenter at one of the early conferences I attended. His books helped many market gardeners get started. Coleman was back in Virginia to speak at the VABF conference in 2011. I used his book Four Season Harvest as a text when I taught at the community college. Conferences are a good place to meet authors with new books. Jean-Martin Fortier is on the schedule at the VABF conference this year. His new book The Market Gardener is not out yet, but the previews remind me quite strongly of New Organic Grower. Fortier may just be the new leader of small-scale market growers. I got a taste of what it was like to attend agriculture conferences and even started a market garden operation, only to have no conference to attend for a few years. I always shied away from organizational politics, so I don’t remember what happened there, just that there was no conference. By the time VABF was ready to put on another conference in 2000, I had made plans to attend the Pennsylvania Association for Sustainable Agriculture (PASA) conference. It was wonderful! Some presenters that come to mind are Vandanna Shiva, William Woys Weaver, and Elaine Ingham (vermicompost tea was a hot new topic at the time). 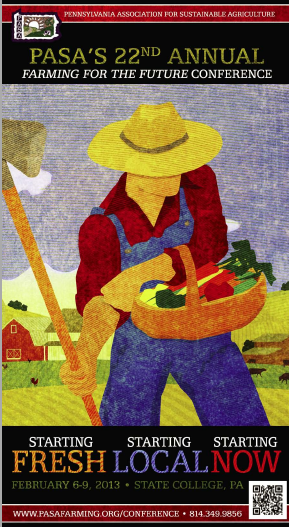 PASA’s Farming for the Future Conference is February 5-8, 2014 in State College, PA.
Southern SAWG puts on a large conference each year. This year it is in Mobile, Alabama on January 15-18. Some years a busload of folks went from Virginia. I heard it was great fun for all, but always at a time when the college semester was getting started and not a good time for me to be away. 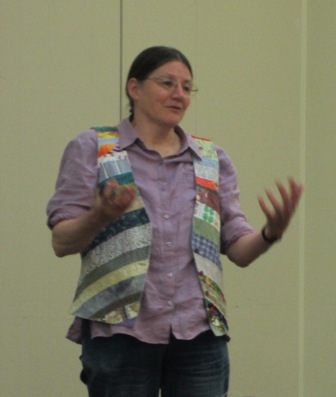 I attended the Southern SAWG conference in Chattanooga, TN in 2011 as a presenter. Being in another part of the country, it was great to meet a whole new set of faces. That year was the first time in over a decade that I wasn’t teaching at the community college in January, with a new semester of students to be planning for. The Ohio Ecological Food and Farm Association holds a conference each year. 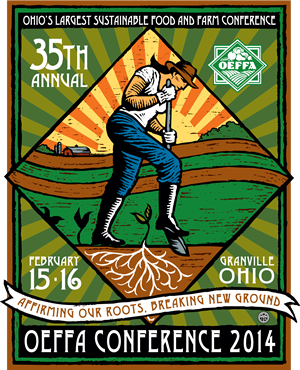 In 2014 the OEFFA conference will be February 15-16 in Granville, OH. I have not been, but according to their website, 1,200 people are expected to be in attendance. I’m sure there are many more conferences planned by many more sustainable agriculture groups around the country. In addition to the speakers, these conferences are a great place to meet like-minded people. When our daughter was a volunteer at Heifer Ranch in Arkansas years ago, she and a few other volunteers attended the second day of a goat conference. They went for the information they knew they would receive, but were confused because so many people already knew each other. It appeared to be a gathering of friends and not quite what they expected. A few months later, she was back in Virginia and attended a VABF conference with me. Then she understood—it was a gathering of friends. It was a time for those of us who already knew each other to catch up on each other’s lives, which made for a lot of friendly banter. It is a time to make new friends, also. I encouraged my students to attend and chided them if they sat together at meals. They could see each other in class each week. I wanted them to embrace the opportunity to meet new people. Farmers, researchers, authors, vendors, and friends (both new and old)—what more could you want to nudge you out of your winter hibernation and get the wheels turning in your head with new plans? Times have changed since 1990. Back then, most people I knew didn’t have a computer yet (including me) and of course, didn’t know anything about the internet. Now you can watch webinars and youtube videos about every subject imaginable. What you can’t do is witness the passion that a speaker has for the subject as you can in their in-person presentation, with the added benefit of impromptu conversations about the matter with other attendees. I’ve told you about the people I was most impressed with who presented at the early conferences I attended. I’ve left it up to you to check out the conference schedules to find out who you might want to see this year. If there is no money in your budget for a vacation, make continuing education a line item and find a conference near you to attend. The cover crops are growing nicely in the garden, with the harvesting of greens and roots being the only thing going on out there right now. The days are short and nights are long. Winter is the time to spend on some self-directed education. Reading this blog and studying my DVDs is a fine start. I have some suggestions for good books to add to your program. All through my blog posts you will find mention of books that I will not repeat here. There is a short list on the resource page on my website. For the others, well you’ll just have to read the posts. These books are more recent and I think you will find them helpful on your journey. I’ll list them from newest to oldest. Sustainable Market Farming is so new that it isn’t even out yet. 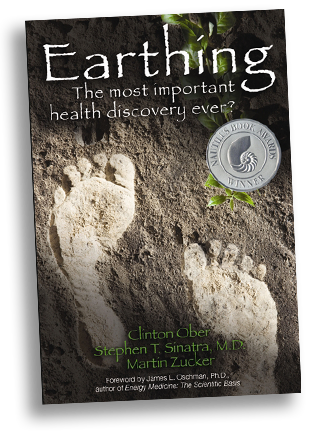 The release date by New Society Publishers is February 1, 2013. I have been looking forward to this book all year and was fortunate to have the privilege of reading an advance copy. Author Pam Dawling is the garden manager at Twin Oaks, a community of about 100 people here in Virginia. She shows you how she plans the 3½ acre garden, manages the crew, coordinates with the kitchen, and generally, what it takes to feed 100. When you grow for the markets you are usually not so intimately involved with your customers as Pam is with her community. Everywhere she goes and every meal she eats, she is getting feedback about her efforts, which is the same as growing for a family, just on a much larger scale. If you have enjoyed my garden planning ideas and would like to get another take on it all, you will like Pam’s book. She has suggestions for planting and harvesting that are helpful whether you are growing for your own kitchen or for your market customers. There are excellent chapters on crops, including peanuts, potato onions and okra- crops you generally don’t hear a lot about. The last two chapters are about saving seeds, a topic of increasing importance to gardeners everywhere. Find out more about Pam, her book and her blog at http://sustainablemarketfarming.com/. You might want to catch her at one of the conferences she will be speaking at this winter. The Permaculture Handbook by Peter Bane, editor of Permaculture Activist magazine, was published by New Society in June, 2012. It is nice to have a permaculture book written in the U.S. showing case studies of various farms and projects. Besides permaculture theory, this book gives practical information and shows it being put to use by Peter and his partner on their .7 acre property in Indiana. Peter discusses coppicing—allowing multiple trunks to grow back for future harvests—a subject I can never find enough information on. I was also particularly interested in his chapter on Diet and Food. Learn more about Peter Bane, his book and where you can find him at http://permaculturehandbook.com/. The Art of Fermentation by Sandor Katz was released by Chelsea Green Publishing in May, 2012. If you are a beginner to fermentation, this book might be too much for you. If what you want is some recipes to get started, read Wild Fermentation first, also by Sandor. If you have already played around with fermentation and really enjoy learning about the culture of food beyond the ferment, you will like this book. To Sandor Katz, food is a celebration. You will learn the deeper stories behind the food. Learn more about Sandor Katz, his books, and where you might find him at www.wildfermentation.com. The Small-Scale Poultry Flock by Harvey Ussery, also a Chelsea Green book, was released in 2011. This book is much more than a how-to-raise-chickens book. A particular interest of Harvey’s (and mine) is Feeding The Flock From Home Resources, which is also a chapter title. Harvey explores raising worms and black soldier fly grubs. He grows cover crops to benefit his garden and his birds. As much as he can, Harvey integrates his chickens with his garden and is always experimenting and tweaking his system. Being in Virginia, his climate is the same as mine. Find out more about Harvey Ussery, his book and his homestead at www.themodernhomestead.us. These books are hefty in both weight and content and not for someone just looking for some light reading. Be ready to delve headlong into the subjects. If your budget doesn’t allow putting them on your shelf, find them at the library. If your library doesn’t have them, fill out a request form. They can get it for you through interlibrary loan or purchase it for their shelves. That’s what libraries do. In fact, it is always a good idea to browse a book at the bookstore, library, or at a conference before you buy it to make sure it will be useful to you, no matter what the reviews say, including mine. Be assured that these authors are passionate about what they do and have written these books because they are just as passionate about sharing what they know with others. I wish you all a wonderful holiday. These books should keep you busy right on into the New Year, as if you don’t already have enough to do. 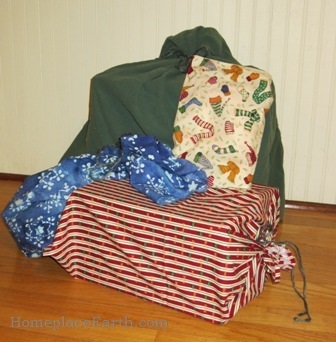 I am taking a break over the holiday season, so my next blog post won’t appear until January 8. See you in 2013! On Tuesday, May 29, 2012 our daughter, Betsy Trice, and I will be presenting Sustainable Vegetable Gardening for Everyone at Ashland Coffee and Tea in Ashland, VA. In case you marked it on your calendar after reading Tuesday’s blog, this is the correct date. Tuesday’s post has since been corrected. Betsy and I will share how we grow healthy food, while at the same time feed the soil and build the ecosystem. Learn how we manage our gardens and take home ideas for your own vegetable growing. 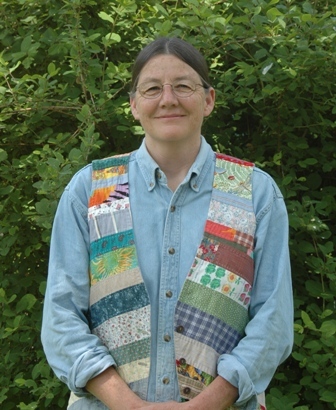 Betsy found her own place in sustainable agriculture during her years in Arkansas and has since moved back to Virginia. She now teaches the sustainable agriculture classes I left at J. Sargeant Reynolds Community College and operates Lightfoot Gardening Coach, a consulting business for those interested in vegetable gardening, backyard chickens, and homesteading. This is the first time we have joined together for a presentation. We will be on hand beginning at 6:30 and the presentation begins at 7:30 pm. Come early to claim your seat. There is no cover charge, however, reservations are recommended.